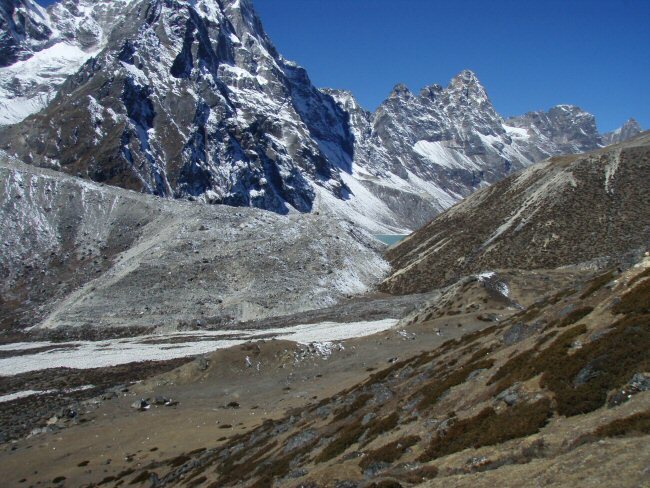 The route from Dingboche to Lobuche is up another 1500 feet, again mostly in one steep climb near the end of the day. We are entirely above the tree line now, and things look pretty barren. We pass a bunch of stone memorials to people killed on various expeditions -- kind of sobering. 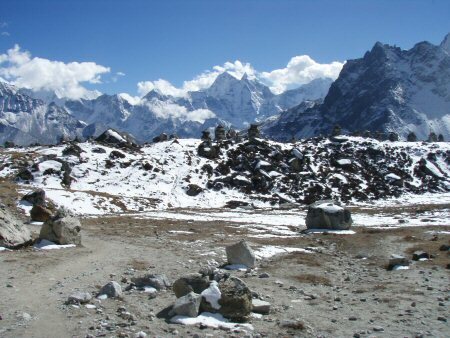 Lobuche is the highest we will camp, over16,000 feet. I felt OK on the hike today -- it was strenuous but not desperate. We are all going slow enough to keep from getting seriously out of breath -- which is pretty slow. In camp, however, everything is an effort: putting on boots, getting up at night to go to the bathroom; even eating dinner is an ordeal. We have all lost our appetite to some extent, but most of us are trying our best to eat something. I can generally eat one helping of everything, unless it is fish. My sore throat has turned into a sinus infection: I have thick, yellow crud coming from my nose and down into my lungs. I hope I feel better tomorrow for Kala Patthar.